Plums are doing great on Mallorca. Even the smallest trees can be loaded with it. Ans is walking Borre every morning and she is passing a finca with a plum tree hanging with some branches over the fence. For a week she came home with a little plastic bag of the fruits. One day I joined her walking the dog and when we got to the tree we concluded that the fruit had to be picked very soon otherwise it would all fall off. Coming home I had the idea of doing an experiment with making wine from it. I located the owner of the finca through Google Maps, called him, explained to him who I am and asked him if we could shake the whole tree. This was no problem and half hour later we went with the Grillo (our utility vehicle) and some plastic crates to the finca. We came home with about 40 kg , which we first washed and then checked them all individually. 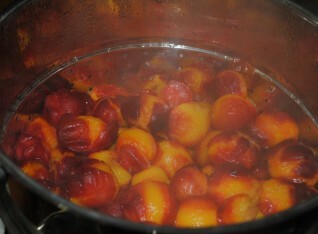 What to do with the plums.... My initial idea as making wine, but when I googled making wine with plums I found that all recipes tell you to add a lot of sugar to it, otherwise it would not taste well. This sets me off immediately, just like with making wine with oranges where you also have to add a huge amount of sugar to it. To me this is so unnatural and therefor not fun to make it. Besides this 40 liter is a very little quantity in a container of 500 liter. For the wine I have a refracto-meter, which is an optical instrument used mainly for measuring the sugar content of grapes. But it works for any juice containing sugar, so I measured it. The result was that it should be possible to get 8% alcohol from it, which is relatively low for wine. The idea to make wine with it was out. So we used a juice extractor pan to get plum juice. 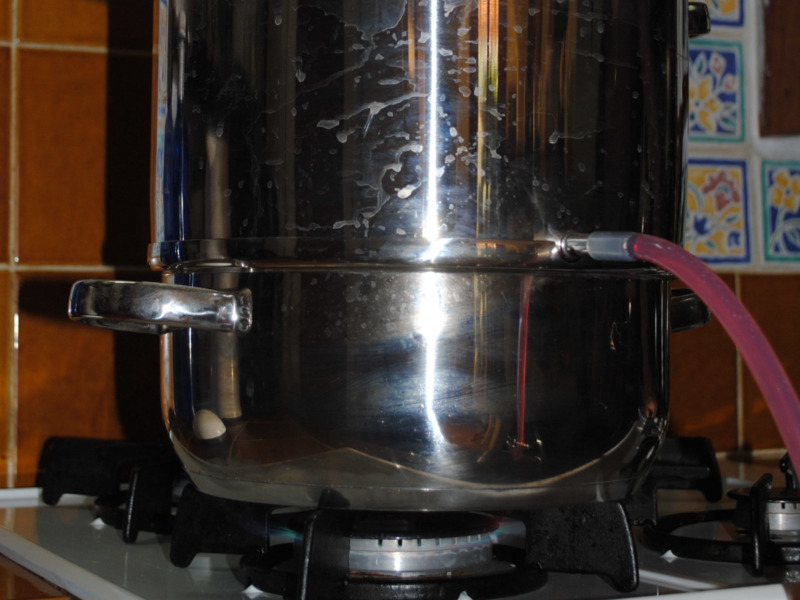 A juice extractor pan set consist of 3 pans: 1: the pan on the fire which contains the boiling water, 2: on top of this the pan which contains the juice and 3: the pan containing the fruit. 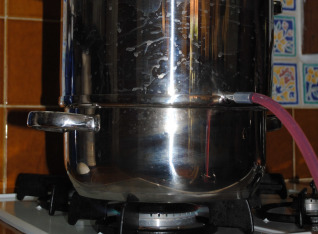 You don't have to do anything with the fruit, just put it in there and you will see that when the water gets boiling the external rubber hose will start dripping the juice. You can do this with any fruit, including even apples. When we had about 6 liter of juice we decided that we had enough of it. 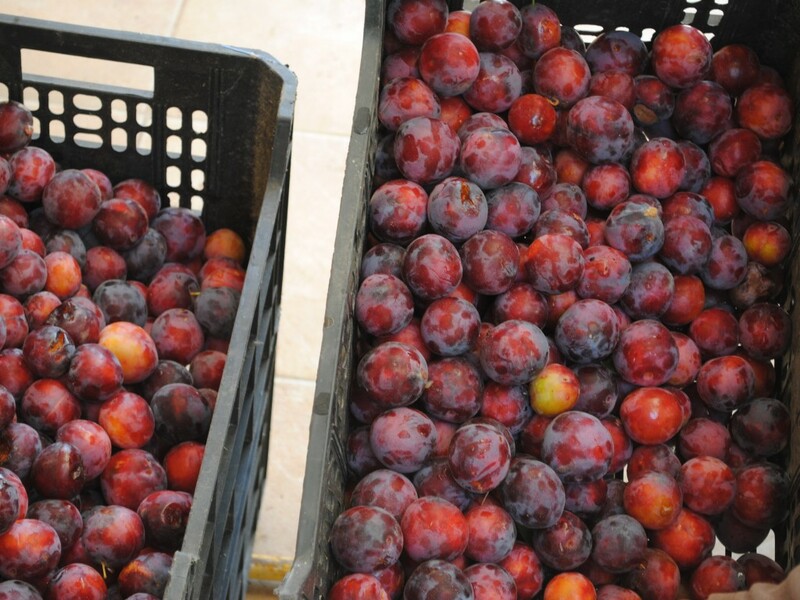 By the way: unlike eating the plums - which are very sweet - the juice is not really sweet and quite sour. I would have expected it to be much sweeter. But it is very refreshing and quite thick as well. If you mix it with some water and put an ice cube in it, it's a great drink in the Summer. 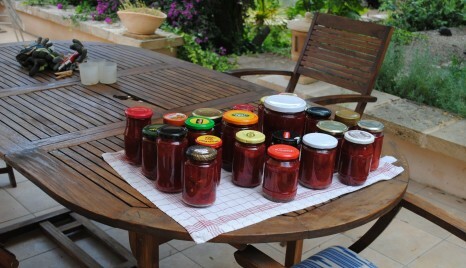 We still had about 10 kilos of plums and decided to make jam of it. See the result below. 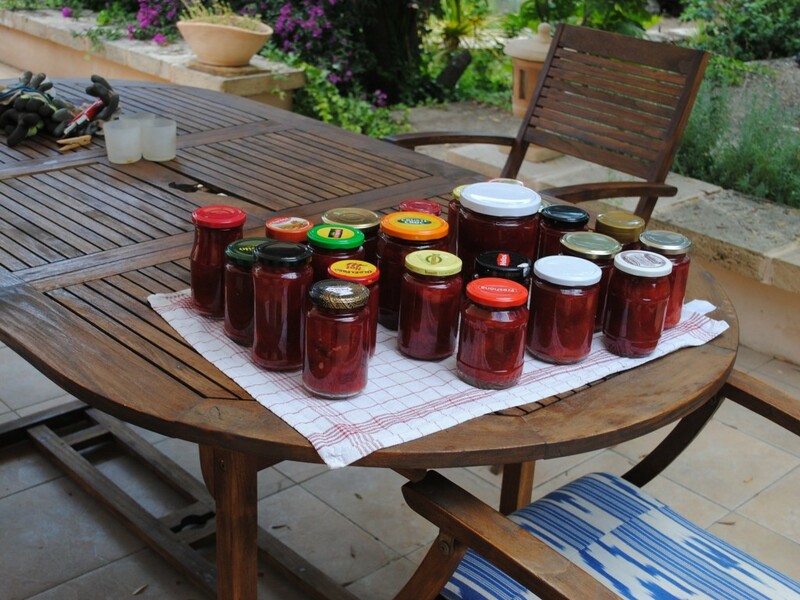 Fillippa - a guest staying in the cottage from Denmark - assisted us with putting the hot jam in the jars (thanks Fillippa !). Is there anything else going on on La Mina San Cayetano? Yes, lots of things, even while it's full Summer now we are still pouring concrete almost daily (step by step for the stairs under the cottage for instance). The irrigation systems have never worked as well as they do now, it's all working smoothly except the occasional hose leakages. Last week we sowed in the grass in front of the cottage and already after a few days the seeds were germinating; it gets greener by the day. We have to keep it wet of course, so we this irrigation group with sprinklers is running for 15 minutes every 6 hours.